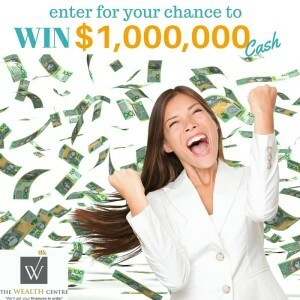 As you will have seen The Wealth Centre recently launched it’s $1 Million Draw. This is where one lucky WA resident has a one in 500 chance of winning $1 Million in December 2016 – and it could be you. Since launching the $1 Million Draw we have received a large number of questions … questions you would ask yourself. To help everyone with the answers they need we have listed them all below… but first things first we wanted to let you know how to enter. Really simple and will only take two minutes. That’s it. Truly simple. There are actions you can take if you want to try earn extra tickets – but you don’t have to. By taking the three simple steps above you will receive your first ticket in the $1 Million draw. No hidden catches. Nothing dodgy. Just a good old-fashioned competition where a WA resident has a one in 500 chance to win $1 Million. And if they don’t win the $1 Million they take home $10,000 as the consolation prize. Once you have claimed your ticket be sure to read our blogs as they arrive in your inbox. The blogs are full of useful information that’ll help you save money and time plus they will also show you ways you can earn extra tickets – if you choose too. Now to the Frequently Asked Questions – including information on our Early Bird Entry incentive draw. If you have questions not answered below please ‘reply’ email or call the office on 1300 132 648. Can we have multiple entries from one family / one household? I already subscribe to TWC – can I enter? Do I have to take any actions? Can I lose my tickets? Why $1 million and where’s it coming from? Will you sell or share my details to anyone? How do I know if I have a ticket? Do I have to spend the $1 million cash with you? What do I have to do during the year? What happens if I book an appointment to earn extra tickets? Why should I enter today? How long will I have to wait for the $1 million cash if I win? 1. IS THIS A GENUINE AND LICENSED COMPETITION? This has been in the planning for a year. We have jumped through 100’s of hoops to bring this to you in 2016. It is legitimate and complies with all State and National regulatory bodies. As you can imagine something this big is ground breaking and has attracted al lot of attention. We are being closely watched – which is good! It means you are protected and everything is above board. 2. CAN WE HAVE MULTIPLE ENTRIES FROM ONE FAMILY / ONE HOUSEHOLD? Yes! Anyone 18 years + can enter. Each person needs their own email address. Generally it’ll be a weekly email. These will be full of important and interesting information on topics such as: Finance, Legal, Accounting, General insurances, Investments, Financial planning. We say generally because we occasionally send out time sensitive and relevant news as it happens. 4. I ALREADY SUBSCRIBE TO TWC – CAN I ENTER? Existing clients can and are encouraged to enter. Simply click this link, fill in the details and then you’re in the draw. 5. DO I HAVE TO TAKE ANY ACTIONS? No! You do not have to do anything other than fill in the entry form. 6. HOW DO I GET EXTRA TICKETS? Apply and qualify to meet a TWC Relationship Manager and on completion of the meeting you’ll receive your extra tickets. 7. CAN I LOSE MY TICKETS? Yes. You must stay subscribe to TWC’s online community until the competition closes. 8. WHY $1 MILLION AND WHERE’S IT COMING FROM? Quite simply I had to do something significant to get your attention and what better than the chance to win $1 Million. You may have heard of a similar competition currently running? A joint venture between Stocklands and 94.5FM. That is what we are doing. A joint venture – only difference is our partner’s details need to remain silent. 9. WILL YOU SELL OR SHARE MY DETAILS TO ANYONE? We absolutely guarantee your details remain private and secured at all times. The only information you will receive is about The Wealth Centre’s services and how we can help you. 10. HOW DO I KNOW IF I HAVE A TICKET? Once you have registered in the $1 Million Draw we’ll send you a confirmation email. 11. DO I HAVE TO SPEND THE $1 MILLION CASH WITH YOU? The cash is yours to do with as you please. Pay off your debts, buy another house, travel, shop or invest. You choose. 12. WHAT DO I HAVE TO DO DURING THE YEAR? Nothing. Simply stay subscribed and read our weekly emails. 13. WHAT HAPPENS IF I BOOK AN APPOINTMENT TO EARN EXTRA TICKETS? A TWC Relationship Manager will meet with you and help you get your finances in order and keep them there. Our role is to ensure your financial future is secure and protected from ANY changes in the economy. Basically, if you follow The Wealth Centre’s 7 Steps you will be able to create more money, time and freedom in your life. 14. WHY WA RESIDENTS ONLY? 2. We are based in Perth and our client base is predominantly WA. 15. WHY SHOULD I ENTER TODAY? The longer you are in the $1 Million Draw the more chances you have to earn extra tickets. Plus you have a greater chance to win our $1,000 Early Bird incentive competition. This is a competition we are running over five weeks. Each Friday we randomly select one entrant from the $1 Million draw. These 5 names are placed in a draw and on the 31 March 2016 one of them will win the $1,000 cash. Make sure you enter today as there are only two weeks left – we already have the first 3 names. 16. HOW DOES THE DRAW WORK? On Friday, 2 December 2016 we close the competition. On Monday, 5 December 2016 we draw one name from all the valid entries. On Friday, 9 December 2016 that person comes to our offices and selects one of 500 envelopes from a barrel. One envelopes contains the $1 Million cash prize. 499 envelopes contain the $10,000 cash prize. They take home the prize they draw. Either way the person walks away with a substantial amount of cash. 17. HOW LONG WILL I HAVE TO WAIT FOR THE $1 MILLION CASH OF I WIN? 28 days and then it is yours to spend! It will be transferred to a bank account of your choice within 28 days. 18. WHY ARE YOU DOING THIS? We know everyone is busy and inundated with too much information. To be heard amongst all the noise and bustle we had to do something big. and a one in 500 chance of winning $1 Million is BIG. We know the services we offer work for our clients. And they will work for you too. We value them highly and want to make sure everyone knows what we do and how we can literally help you “get their finances in order – and keep them there”.